I’m not sure I could be bothered will all of this all of the time but it’s good to know as I too love the crisp perfection of hotel beds. It’s also well worth reading the comments after this article for yet more hints from readers. SERVES 8 with leftovers. PREPARATION TIME 15 minutes. COOK approx 4 hours for a 4.5 – 6 Kg (10-12 lb) bird. 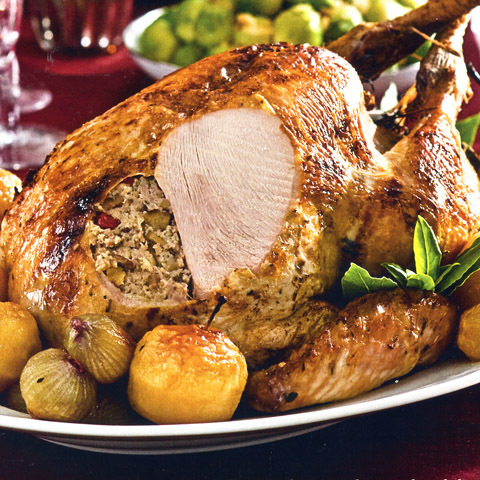 Choose a free-range bird for the best flavour – they’re more expensive, but well worth it for a special occasion. Here in the UK I’ve found KellyBronze has a good flavour. Heat the oven to 190C / 375F / Gas 5 / 170C for a fan oven (approx 365F). Wash and dry the turkey, removing any feathers. Pull out the giblets and the neck, then set aside. Lift up the skin that covers the neck opening, then stuff the stuffing up and under the skin, securing it tightly underneath with a skewer or two cocktail sticks. Weigh the stuffed turkey (you may to use bathroom scales to do this), then calculate the cooking time, allowing 40 minutes per kg (20 minutes per pound). Put the leeks and carrots in the bottom of a roasting tin in a single layer – this makes a trivet for the turkey to sit on, keeping it out of the fat that pools in the bottom of the tray and also adding flavour to the gravy. Take the neck from the giblets you had set aside and add to the tin (again for flavour). Sit the turkey on top of the layer of carrots and leeks and coat the breast all over with butter. Pour in the cider, cover with foil, then roast according to your timings. Keep checking the tin every 20-30 minutes and if the vegetables look like they’re burning, add a splash of water or cider. At 30 minutes before the end of cooking, remove the foil and season generously with salt and pepper. 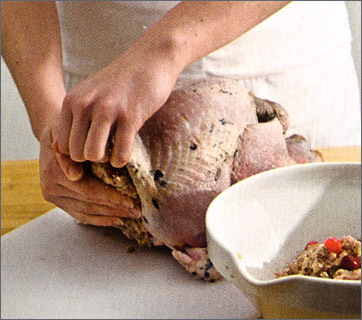 To test if the turkey is ready, pierce the thigh through its thickest part – the juices should run clear. Take the turkey out and leave to rest, covered with a clean tea towel. Leaving the bird to rest is essential in order to allow the fibres of the meat to relax again and for the residual moisture to redistribute in the flesh. You can leave the turkey to rest for up to an hour. Drain the fat and juices from the tin into a jug, discarding the veg and the neck. Place the tin over a flame then pour in the cider, scraping up the flavour filled crusty bits with a wooden spoon. Reduce the cider by half, then strain into a saucepan (this will save you hob space later). You should find that by now the juices you poured out of your roasting tin into a jug will have separated out – the fat floating to the top. Carefully tip off this excess fat, then add the remaining juices to the reduced cider and pour in the stock. ***Reduce over a high heat for about 10 minutes until slightly thickened. Stir in the quince jelly, taste and then season if necessary – if you’re using commercially pre-prepared stock be warned that this usually contains a lot of salt so your gravy may only require a little cracked black pepper by way of seasoning. Pour the gray into a serving jug or gravy boat, any resting juices that have come out of the turkey should go in now too. ***If you prefer a thicker gravy, mix 1 tsp cornflour with a splash of cold water, then add to the gravy, stirring constantly until smooth and glossy. This recipe has been slightly adapted from one that appeared in the December 2007 Christmas edition of BBC Good Food magazine. All photos from the same article. If you want to go organic and steer clear of chemical fertilisers in the garden then there are a few natural alternatives. Common nettles make a good, if smelly alternative to commercially prepared chemical versions (another good reason to leave a patch of your garden to run wild). For obvious reasons, wear some rubber or gardening gloves to harvest, tear and scrunch up enough nettle stems and leaves to loosely fill a watertight container such as a bucket. Then weight them down, say with an old plate. Fill the container with enough water to cover the crushed greenery and then leave to rot down. (This is a bit smelly so you may want to place this somewhere away from the house)! The brew should be ready to use in 3 to 4 weeks and needs to be diluted for use – usually in a ratio of roughly 1 part nettle liquid to 10 parts water (the resulting diluted liquid should look the colour of tea). You can keep topping up your supply bucket with nettles and water as the season progresses. Once your flowers have finished flowering and you no longer have use for the homemade fertiliser, just tip what remains onto the compost heap. Another alternative is coffee grinds. Sprinkle them around plants before you water or before rain and the grinds will slowly release nitrogen into the soil. Crushed eggshells are a well-known old-fashioned fertiliser and work particularly well scattered around roses because of their calcium carbonate content. (An added bonus is that their sharp edges also help to deter slugs). If you’re lucky enough to live by the seashore then some of the best fertiliser is freely available in the form of seaweed. You can either treat it in the same way as the nettles above and make a ‘tea’ out of it (which again needs to be diluted for use) or, if it is winter time, dig the seaweed directly into plant borders to feed and condition the soil. Lastly, but by no means least, consider making either a compost heap or set up a worm composting bin. In my experience worm bins don’t smell (I kept mine in the garage) and given time they produce wonderful, fine compost and the ‘run-off’ is a good liquid fertiliser for the garden (use diluted as above). I’ve just written about my own addiction to this glorious drink over at my regular blog and just thought that I’d give you a quick run-down of perhaps lesser-known facts about tea because…well just because you can never know too much about something you love. Did you know that tea, in its dry form contains more caffeine than coffee? However, just to confuse you, a prepared cup of coffee contains higher levels than prepared tea. Unlike coffee, tea also contains valuable anti-oxidants that are associated with preventing cancer and heart disease. Tea is made from the leaves of a camellia plant, in this case Camellia Sinensis. Since tea was first introduced into Britain (during the reign of Queen Elizabeth I, 1533-1603) it has been credited with healing powers. This is reflected in a few current English brand names – P.G. (which is said to stand for ‘pre-gestive’) and Typhoo (which is Chinese for ‘doctor’). A New York merchant named Thomas Sullivan is credited with having invented the first tea bag in 1904 when he sent out samples enclosed in silk. As a nation the British drink 175 million cups of tea daily and this consumption makes it our number one beverage. The habit of drinking black tea with lemon was a Russian habit introduced by the eldest daughter of Queen Victoria, the Princess Royal, who was married to the Emperor of Prussia. However the habit never caught on amongst the general British population as the overwhelming amount of tea is drunk nowadays with milk. ‘Char’, as in the English expression ‘a nice cup of char’ (i.e. tea) is derived from the Chinese word for tea – tcha. Finally – making tea. There has been an on-going debate about whether to add the milk to the tea first or second. Those who brew their tea and then add the milk insist they are right. I say they’re wrong and now I’m being backed up by scientific evidence (there’s nothing like being smarmy is there)?! Adding the milk after the tea has brewed precipitates the release of tanins, which tend to make the tea taste more bitter, not to mention causing worse staining of your teeth and the tea cups. Also, the proteins in milk more easily split and divide if added to the hot tea, leading to clumping. …And no one wants clumpy tea now do they?. If you’re reading this, logic tells me that you are concerned about lack of sleep. First of all, it’s important to say that while 8 hours is the accepted norm for a good night’s sleep, you needn’t necessarily feel bad because you routinely sleep for less than this. Some people actually only need 4 hours (Margaret Thatcher being a famous example), while others are out for the count for a full 12 (just about every teenager on the planet). However, sleep deprivation, when your body is telling you that you need more rest (! ), can be both debilitating and depressing and no one really wants to resort to potentially addictive chemicals to solve the problem. There are so many possible causes, cures and herbal remedies that I thought it might be helpful to put together a whole list of them. I hope you’ll find something here to help. Lavender has been known for centuries to induce relaxation and can be used in a number of ways: a couple of drops of essential oil sprinkled on the corner of your pillow will help, as will lavender oil in a cold diffuser placed in the bedroom. A warm bath, at the optimum time of two hours before bed, helps to regulate body temperature to an ideal level and is particularly helpful when combined with lavender products like bubble bath and body lotion. Herbal teas can also prove useful – chamomile and valerian (which is often combined with hops) are both well-known for aiding relaxation and sleep. While both will help with insomnia, I’ve read recently that valerian, especially when combined with ‘chaste tree’ may help with sleep maintenance. Even 20 minutes of gentle exercise during the day can help to stop stress hormones from interfering with sleep. Try to avoid heavy meals just before bed – a minimum two hour gap between meal and bed is a good idea. Avoid caffeine drinks like regular tea, coffee and cola in the evening. Is your actual bed ‘up to muster’? The lifespan of a bed depends largely upon quality but as a rule of thumb, if your bed is ten to twelve years old you should probably replace it. (Here’s a tip: If you suffer from backache, it may just be your bed)! Equally, do you need new pillows? There are a huge variety of pillows out there – foam, feather, down – and it may just be that a change of pillow would help you get a restful night’s sleep. Try to avoid sheets with a high synthetic content. Sheets with a high cotton content allow your skin to breathe, which in turn makes the bed feel more comfortable. (I tend to buy sheets with a maximum cotton / minimum polyester content, simply because I’ve found some pure cotton sheets can be an absolute swine to launder). Try to ensure that your bedroom is furnished fairly simply and is clutter free. Psychologically, a clutter free bedroom makes for a calmer and more relaxing atmosphere. Look at using colours for walls, carpets and soft furnishings that you personally find relaxing. Traditionally shades of blue and green evoke feelings of calm and relaxation in many people but you may have something else in mind. (For example, I always seem to opt for gentle creams). Try not to watch TV or work in bed. Your bedroom should become associated in your mind with your own haven of peace and utter relaxation. The best temperature for a relaxed sleep is surprisingly cool, i.e. 68 degrees. Fit individual thermostats to radiators if you can so that you can keep your bedroom at this temperature (and save money)! It goes without saying that minimising noise and light will also help – it’s strange but true that even though you are asleep you will become aware of increasing light levels in a room where the curtains / blinds allow the morning light to percolate through. If you live in a quiet area and it is safe to do so, leaving a ‘top light’ /small window slightly ajar to let in some fresh air is a good idea. Good sleep doesn’t happen easily in a stuffy, ‘sealed’ room with stale air. Airing the room each day, allowing a fresh supply of oxygen to flow through your room will keep it smelling sweet and welcoming. Toss back the covers each morning to allow cool air to permeate the bed covers. Even half an hour of this while you shower will keep the bed smelling fresh (not to mention keeping any mites at bay)! Make the bed each day – an un-made bed doesn’t exactly call you to its gentle embrace, now does it? Change the bed sheets each week (hopefully you knew that one already)! Remember if this is an on-going problem and you feel at all concerned you should still talk to your doctor. Salted butter – Salt is a preservative so that the addition of salt to butter gives it a longer ‘shelf-life’. Salted butter will last about a month in the fridge, six months in the freezer. Unsalted (or ‘sweet’) butter is the freshest butter available, with an accordingly fresher taste – largely because the natural sweetness of the product isn’t masked by salt. However, without that extra preservative it will not last as long. Given the above, good traditional bakers usually opt for unsalted butter in recipes – the flavour is better, there is the option to decide just how much salt should be added, and too much salt tends to produce a tougher dough. At a pinch (no pun intended), ready salted butter can be substituted in baking recipes, but remember to reduce, or cut out entirely, any extra salt noted separately in the ingredients list. (If you have to use salted butter in a recipe because that’s all you have, the rule of thumb would be to cut salt by 1/4 tsp for every 4 ounces, or half a cup of butter that is in the recipe). Light / reduced calorie butter is made with half the fat of regular butter and in order to approximate the consistency of the full fat version, water, skimmed milk and gelatin are added. As a consequence, it will give different results when used for baking and frying and is therefore not recommended. In some countries whipped butter is also available. Its’ whipped texture makes it lighter and more spreadable but the process of whipping means that it is actually 30 – 45% air. For this reason it also is not generally recommended for baking. When frying and sauteing, it is better to use unsalted butter. If you wish, the addition of just a teaspoon of oil will allow you to heat the oil to a slightly higher temperature before it begins to burn but both salted and unsalted butter have low smoke points (the point at which the butter burns). 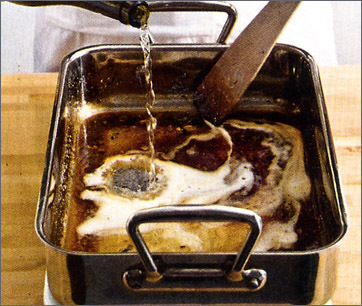 Clarified butter is used widely in fine cuisine as the basis for sauces and, as most of the milk solids and water is removed during preparation, allows for cooking at higher temperatures without burning (useful for frying and sauteing) . To clarify: gently melt a quantity of butter in a pan and, using a metal spoon, skim off the solids that begin to foam up on the surface. Be careful not to allow the butter to burn. When you feel you’ve removed as much as you can, pour the melted butter through a sieve which has been lined with cheesecloth or muslin, into a bowl beneath. (These solids can be thrown away but are also considered a delicacy in Northern Indian cuisine, being eaten with unleavened bread). The clarified butter in the bowl will last in the fridge for up to a month. Ghee is very similar to clarified butter, the differences being that all the water content has been evaporated off, all the milk solids removed and the remaining butter has been allowed to brown slightly, giving the ghee a nutty flavour. Pure ghee will keep at room temperature for months and, as with clarified butter, can be heated to high temperatures. The process of preparation has removed casein, lactose protein (often a problem to those with allergies) and oxidised cholesterol, whilst still retaining valuable vitamins. Its’ more intense, nutty flavour also means that you will probably use less of it in cooking. Ghee is available in Indian and Middle Eastern grocery stores, as well as in some supermarkets. Butter absorbs the flavours around it so is best stored in an airtight container or wrapped carefully in foil. To soften butter quickly for baking, cut into small cubes and leave at room temperature.